Mesa goalkeeper Adolfo Araujo dives for Chandler's Rodrigo Olguin's penalty kick try in the first half of their 6A play-in game on Thursday. Araujo made the save in Mesa's 4-1 victory over Chandler. (AzPreps365 photo). It's a rare soccer match that a team scores on a penatly kick barely a minute into play. That's how Mesa High got the jump on Chandler in their 6A play-in game on Thursday night. Chandler got equal time midway through the half, but the Wolves' penalty kick was repelled protecting Mesa's 1-0 advantage. "I think that was the turning point," Mesa coach TJ Hagen said. "It kept them from getting momentum. We ended up with two more goals in the half. That save was huge for us." No. 14 Mesa took a 3-0 lead to intermission and went on to post a 4-1 victory over No. 19 Chandler in a match that got chippy in the second half at Jackrabbit Stadium. It was the third time Mesa and Chandler met this season with Mesa winning two and tying the other. Last year Chandler defeated Mesa in a first round state match on the way to the semis. Mesa advances to the 16-team state tournament and will be on the road in its first round game on Saturday. The Jackrabbits and the rest of the 6A, 5A and 4A conferences find out their tournament fields on Friday when the AIA reveals the pairings on its bracket show beginning at 2:30 p.m. Mesa improved to 12-5-3 for the season. Chandler, which reached the 6A semis last year, finished up 8-9-4 after a promising 6-2-2 start in its matches in November and December. Mesa junior Tony Perez, the Jackrabbits leading scorer, enjoyed the best night offensively with two goals and an assist. Perez's goals give him 20 for the season, two shy of the school record. Perez converted the penalty kick in the second minute. The score was still 1-0 in the 20th minute when Mesa fouled in the box. 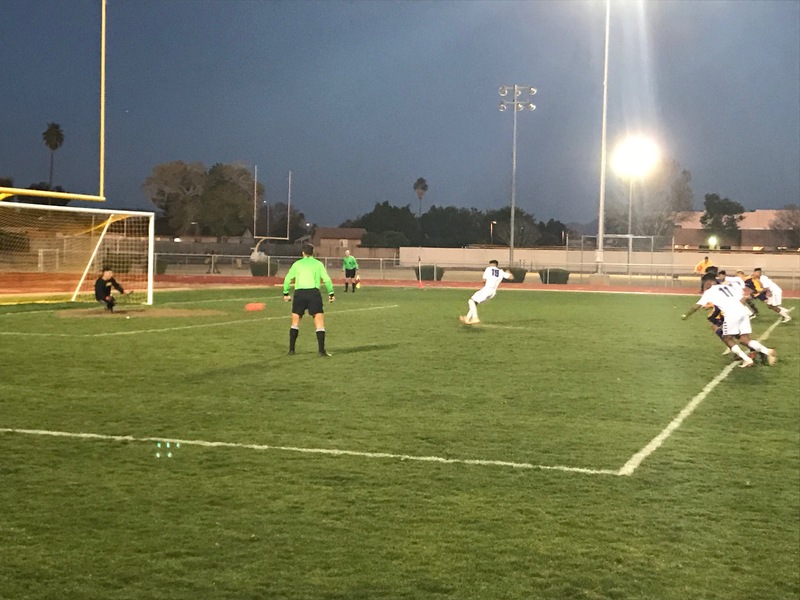 Chandler's top scorer Rodrigo Olguin, lined a low-trajectory kick, but Mesa keeper Adolfo Araujo dove to his right and smothered the attempt. Mesa went on to blank Chandler the rest of the half and added insult to injury tacking on two goals in a one-minute span before time expired in the half. Perez knocked in his second goal in the 31st minute with short, sharp assist from Luis Alonso. The third goal was more stunning with Mesa defender letting a free kick fly from midfield that was headed in from about 15 yards out by freshman Easton Elzinga. "That's how our season has gone," Chandler coach Sasha Hunter said. "Giving up those two goals in a minute and eight seconds. That was rough." Chandler had a brief moment when a comeback might have materialized. Alan Valadez knocked home the Wolves' lone goal in the 54th minute to make it 3-1 -- moments after Araujo deflected what appeared would be a sure goal. Seconds after Valadez's goal a fracas broke out inside Mesa's goal. Players from both teams filled the net and when an injured Chandler player was taken care of and members of both teams separated, Araujo was sent to the sideline with a red card. Araujo's red card also means he must sit out Mesa's first-round match on Saturday. Several cards were handed out in the second half and fouls increased dramatically over the final 25 minutes. Mesa played the final 26 minutes down a player due to the ejection, but managed to keep Chandler off the scoreboard to the finish. The Jackrabbits took Chandler out of it by scoring a short-handed goal in the 65th minute to complete the evening's scoring. Perez earned the assist with corner kick converted by Julian Ramirez.